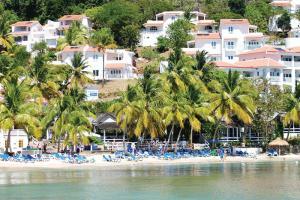 Enjoy barefoot luxury at St. Lucia's Windjammer Landing Villa Beach Resort. Balancing culture, entertainment, romance and adventure, this resort provides guests with everything they need to create a memorable experience that is uniquely Saint Lucia. With personal touches and attentive service, the resort is ideal for a romantic escape or a relaxing family vacation. Located just 2 miles from Reduit Beach. Dragonfly, Papa Don's Taverna, Embers, Upper Deck, Jammers. Jus' Sail, Lucian Style Segway Day Tours, Sea Spray Day Cruises.